General Hospital (GH) spoilers tease that the ABC soap is gearing up for a crushing May sweeps death. After the sweeps period kicks off, Oscar Nero’s (Garren Stitt) time should run out. However, his health will certainly head downhill in the meantime. Terrible news will spread about Oscar next week, so this will begin the rapid decline that leads to his demise. On April 3, Josslyn Jacks (Eden McCoy) and Cameron Webber (William Lipton) will share breakfast together. He might swing by with some baked goods or perhaps meet her at Kelly’s. Regardless, Joss may be busy chatting with Cam when disaster strikes for Oscar. That could lead to some guilt once Josslyn gets updates. General Hospital spoilers say Dr. Kim Nero (Tamara Braun) will face devastation on April 4. It won’t be long until Drew Cain (Billy Miller) faces that tough blow, too. They may learn that Oscar’s had a horrible seizure, which will likely affect him far more than the ones before. Dr. Terry Randolph (Cassandra James) prepared Oscar’s family for debilitation, but it’ll still be difficult to accept. Oscar may not be able to leave GH again after his next ordeal. Kim, Drew and Joss will all have to watch Oscar’s tumor take a toll. They’ll all do their best to say their goodbyes and get ready for this loss, but you can never truly be ready for something like this. The pain is still going to be unbearable. 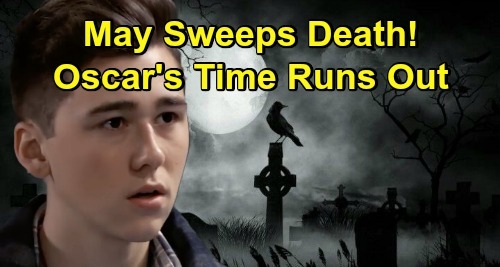 General Hospital spoilers suggest Oscar’s death will bring a whole new set of issues. Drew will have to cope with losing a son he barely got to know. Kim will have to deal with her whole world crumbling down. Josslyn will have to let go of her first love and try to build a new future without Oscar. This loss will affect their lives in so many ways, so there’ll be plenty of good storylines in the months ahead. As for GH fans, we’ll get some gripping drama out of this. Oscar’s final days should be filled with sorrow, but the cast members involved should get a chance to shine! We’ll keep you posted as other details emerge. Stay tuned to the ABC soap and don’t forget to check CDL often for the latest General Hospital spoilers, updates and news.